It’s always interesting to see what’s “going viral.” Oftentimes it’s a hit pop song or music video, or some other video giving a quick dose of ridiculous comic relief. But sometimes the world of social media provides a sudden and real opportunity for all people of good will to unite behind a cause for justice on behalf of an individual or a particular group. In the case of the hashtag “#WeAreN,” that recently spread rapidly through the Twittersphere, it is a cause for solidarity. The trending hashtag is a response to the official announcement that the radical Islamist group known as ISIS (the self-proclaimed Islamic State of Iraq and Syria) has successfully ridded the city of Mosul, located in northern Iraq in the biblical region of Nineveh, of its Christian population. The 2,000 year old faith community had little choice than to leave when the radicals threatened to kill them if they refused to convert, pay a tax or leave the city without their belongings. In response, a global outcry has arisen on behalf of Mosul’s Christians including some Muslim communities. Pictures are being shared over the internet, for example, of Christians and Muslims standing side-by-side in Baghdad protesting the extremism in the north. Pope Francis has been no less outspoken, and his frequent references to an emerging “ecumenism of blood” over the past year seems to have found concrete expression as a result of the crisis in Mosel. To see such widespread support for the suffering Christians is an incredible and inspiring thing and it reminds us of the amazing possibility of unity and reconciliation that is born of chaos. But it is also an opportunity to reflect on the meaning of solidarity, how it shines forth from the heart of the Gospel, and why therefore it is one of the fundamental principles of the Church’s social teachings. We have to say firstly that most people and most Catholics today are uninformed about what the Church means by solidarity. It should also be said that the participation of so many well-intentioned and genuinely outraged individuals in the #WeAreN movement is not necessarily the full expression of what the Church means by solidarity. In the same article, Chaldean Auxiliary Bishop Shlemon Warduni of Baghdad said, "We need action first. The world is not bothering with what is happening to Christians in Mosul." Through a few creative minds and the power of social media, millions of people are becoming aware of the crisis in Mosul and throughout Iraq. 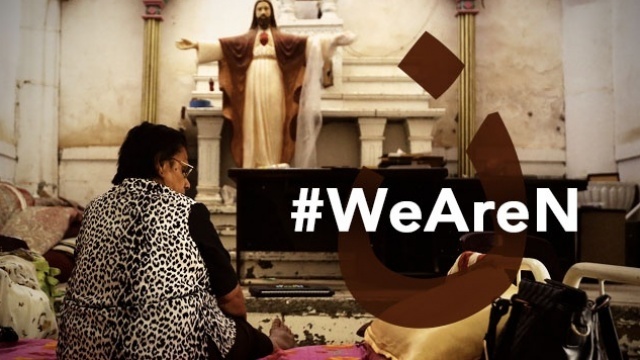 The trending hashtag #WeAreN has united Christians, Muslims and many people of good will. The common motivation to participate undoubtedly stems from some form of belief in the fundamental rights and equality of human beings. It is a hopeful sign. As Christians it is important to go deeper. Solidarity, like being a Christian, is a way of life; it is about action. In fact, it is through the lenses of faith that solidarity transforms into an even more powerful force, ultimately inspiring a person “to take on the specifically Christian dimensions of total gratuity, forgiveness and reconciliation. One’s neighbor is then not only a human being with his or her own rights and a fundamental equality with everyone else, but becomes the living image of God the Father… One’s neighbor must therefore be loved, even if an enemy, with the same love with which the Lord loves him or her.” (CSDCC, 196) Let us pray for our brothers and sisters from Mosul, and that we may have the strength to stand in solidarity with them.